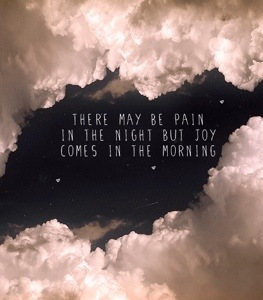 “…weeping may last through the night, but joy comes with the morning” (Psalm 30:5, NLT). Heavenly Father, thank You for joy. Thank You for peace. Thank You for walking me through the difficult times. I choose today to answer the door for joy every single morning so that I can walk in the strength You have given to me. In Jesus’ Name. Amen.